Mariner’s Pointe on Lake Hopatcong, New Jersey. A boutique condominium community of just 35 townhomes in the midst of one of New Jersey’s most popular vacation resorts. Less than 50 miles from Manhattan, about an hour’s drive west of the city, Mariner’s Pointe offers affordable lakefront living with resident amenities and stunning views. Easily accessible via New Jersey Transit, bus, or car, these brand new construction townhomes are ideal for year-round living, an escape from city life, or both. 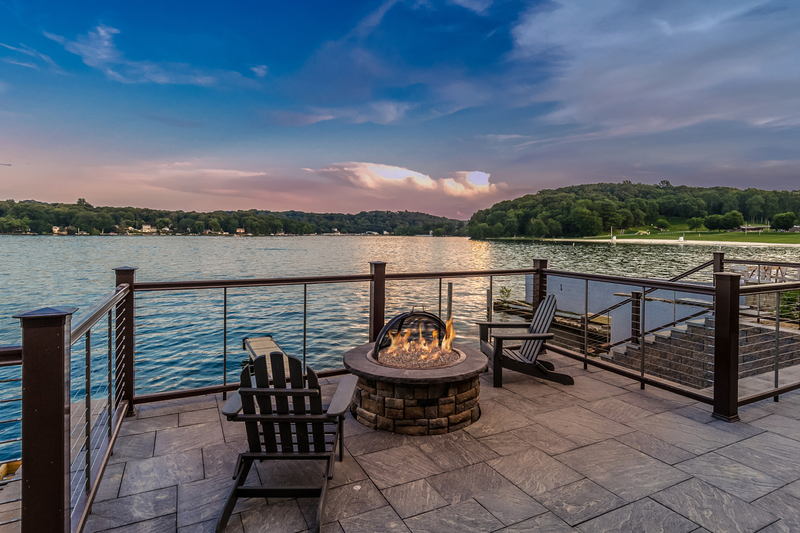 Located along Lake Hopatcong, New Jersey’s largest lake sporting 45 miles of shoreline, Mariner’s Pointe takes full advantage of the lakefront landscape where many homes boast water views, a private patio, and a deeded boat slip. Simply look out across the lake or listen to the sound of the water lapping softly, it is a serene way to start and end the day. And Lake Hopatcong is alive with activity as well, offering a slew of watersports and a vibrant community. Three unique townhome designs featuring up to 2,248 square feet of living space are available at Mariner’s Pointe. The community’s “Lakeside Homes” collection offers carriage-style townhomes with two (Spinnaker Model – 1,666 square feet) or three (Regatta Model – 2,248 square feet) bedrooms, 2 ½ baths, a one-car garage, and private patios or balconies with pristine views over open water. Also available is the “Woodside Homes” collection, which features the Charthouse townhome design (2,027 square feet) with three bedrooms, 2 ½ baths, a two-car garage, and patios and balconies with views of the surrounding woodlands. Exquisitely finished, the homes feature Bargello wide-plank hardwood floors and luxurious carpet. 9-foot ceilings and wraparound windows let in all the light, air, and surrounding beauty, and an open floor plan flows seamlessly from one room to the next, from inside to outside. A gourmet kitchen offers ample space for storage, cooking, and entertaining with custom cabinetry, quartz countertops, stainless steel appliances, and a large island. Overlooking the main living and dining areas, the kitchen truly feels like the heart of the home and creates the perfect place for entertaining. Spa-inspired baths provide another kind of retreat, grounded by modern porcelain tile complemented by the warm wood vanity topped with quartz or stone. The master bath is a sumptuous experience with a dual vanity and an oversized standing shower with a subway tile surround. Amenities for residents abound at Mariner’s Pointe, starting with a deeded private boat slip along the permanent dock. Attached to steel pilings, the dock features a bubbler system for winter protection and access to electrical hookups and hose bibs. Each large slip can accommodate many types of watercraft. Residents also have a secure storage for all the accessories that go along with an active life on the water spent boating, fishing, swimming, canoeing, kayaking, paddle boarding, or water skiing, all of which are launched effortlessly from the 455 feet of private shoreline. Mariner’s Pointe offers a covered lakeside pavilion for the community and a sundeck with spectacular views. Also along the lakefront is a multi-level common space with a gas fire pit, gas grills, paved sundeck, plenty of seating, and a chance to socialize. Lake Hopatcong is also a chance at adventure with hidden coves and small islands to discover, and after a day of exploration, pull up to any one of the restaurants that ring the lake for dockside dining. Starting in the mid-400’s and available immediately, Mariner’s Pointe is an affordable and convenient way to make the most of the summertime and beyond. Living at Mariner’s Pointe offers access not only to Lake Hopatcong but also the surrounding outdoor splendor. A dozen golf courses are only a half hour away, Stokes State Forest is nearby, and even popular ski resorts in the Poconos and Sussex County, as well as Mount Airy Casino Resort, are leisurely options. Easy access to Manhattan and the proximity to truly year-round recreation plus resort-style amenities anchored by high-end new construction, Mariner’s Pointe is by far both home and away. Incentives are available for a limited time. The Mariner’s Pointe sales office is located at 16 Lawrie Avenue, Hopatcong, NJ, and model homes are available to tour Saturdays and Sundays from 11 a.m. to 4 p.m. or by appointment. To schedule a viewing, contact Zachary Newlands at 973-262-1003 or visit the Mariner’s Pointe website.